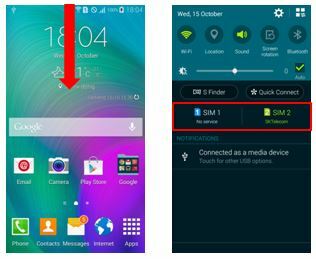 On the Home screen, tap Apps → Settings → SIM card manager → Tap one or both of the switches for the SIM or USIM cards to activate them. If both cards are activated, you can receive calls and messages on each card. However, if you are on a call using one card, the other card cannot be used to receive new calls. 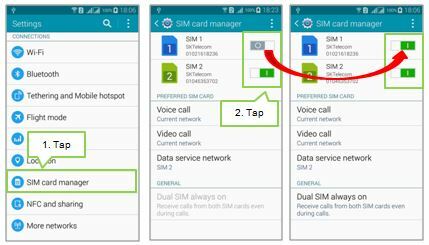 Unable to disable all SIM cards at once. On the Home screen, tap Apps → Settings → SIM card manager → Select a SIM or USIM card and tap Register name or Select icon. Set a display name and icon for each card. When two SIM or USIM cards are activated, card selection icons appear on the dashboard of the notifications panel. Open the notifications panel and then select a card.